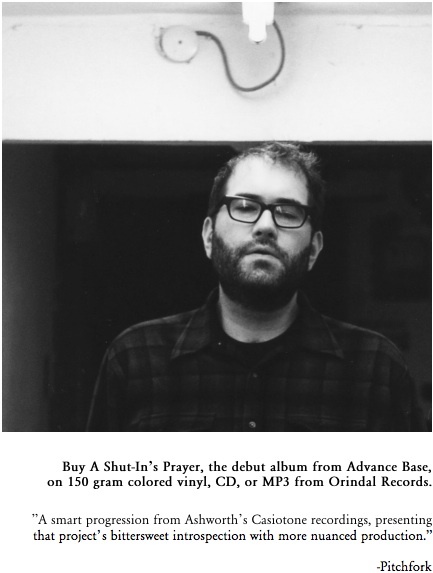 Owen Ashworth, the quietly monumental talent behind Casiotone For The Painfully Alone, has brightened our lonesome hearts once again with his new release as Advance Base, A Shut-In’s Prayer. The frontman continues to carry a massive light and accompanying bushel with his new project, but the material feels different–wide-eyed, even. From the head-tossed tambourine fuzz of “Summer Music” to the palpable desperation of “Shut-In River Blues,” Ashworth purposes his signature lo-fi–the perfect marrow grittiness of raw musical exposition and an unencumbered yet hard-wrought perspective–into a complex, emotional carnival of recollected textures. At the core, Ashworth has taken very simple materials–a keyboard and words–and has built a musical village with them. We are listening. Owen Ashworth talks with Grand Abandon. GA: A Shut-In’s Prayer is an interesting title and grabbed me on first take. Even before I knew it was you who was behind Advance Base. Even before listening to the album. I saw the title and was like, “I want to listen to that,” because it’s like this labyrinth idea that you can get very lost in. It seems to be a reference to essentially the most private form of acknowledging that one needs to belong to something bigger than just the self. But then the “prayer” is actually an album, which is actually an extremely public form of connecting to the context in which one resides. What does A Shut-In’s Prayer mean to you? Owen: Thanks, I like it, too. I didn’t know what to call the album & then I remembered that I’d almost named a Casiotone for the Painfully Alone album A Shut-In’s Christmas. I thought about that title again, & then I read some definitions of “shut-in” on the internet & learned that a shut-in river was an Ozark term for some water that used to be a river but doesn’t go anywhere anymore. I thought that “Shut-In River Blues” would be a good name for the instrumental that ended the album, & then I thought about how the song “New Gospel” is basically about a shut-in person, & that was enough for me. There are some religious themes in “New Gospel” & I guess that was where I got the idea to call the whole thing A Shut-In’s Prayer. I searched the phrase “A Shut-In’s Prayer” on the internet to make sure that no one had beaten me to it, & discovered that it was the title of a bluegrass song. I found a nice recording by East Ohio Grass on YouTube, & as soon as I heard that thing, I felt good & decided that I’d figured out my title. It has a desperate & old-fashioned quality that appealed to me & seemed to suit the lonesome sound of the songs I’d recorded. GA: I read that you recorded some of the album at the Chicago Public Library. What was that like? Did you go at a specific time of day? Owen: My friend Ed Crouse played most of the upright piano on the album. It was his idea to record his parts in one of the piano rehearsal rooms at the Harold Washington branch of the Chicago Public Library. Ed & I took the train downtown early one morning & sat outside with coffee until the library opened. I handed over my driver’s license & signed a thing, & we were all set. I brought a digital field recorder & a drum machine to keep time & we recorded tracks for four of the songs on the album within a couple of hours. I thought it worked out great. I think the trick is getting in there really early before some other people start banging out Rodgers & Hammerstein songs in the adjacent rehearsal rooms. GA: In your interview with Low Times you talk about when you first started making music and how you kept it a secret from everyone and felt embarrassed about it. Can you talk more about this? GA: You talk about familial ties and relationships forged during youth on the album. About growing apart and remembering those who knew you from the beginning. Why do you think this theme runs so strongly? Owen: Having a baby inspired a lot of the family themes on the album. Most of the songs were written & recorded while my wife was pregnant, & during that time, we were having a lot of conversations with our parents about their lives when they were having kids, & about our childhoods & their childhoods & just all kinds of family stuff. There was a lot of nostalgia going on, while we were feeling very anxious & excited about our near future. “Goldfish In A Robin’s Nest” is probably the least literal song on the album, but it’s about waiting to have a kid. GA: You write very specifically about setting. Whether it is in a deserted town on Christmas, near a kitchen with a boombox, in the pantry against the pancake mix, in a taxi cab, or next to neon lights, your music always takes place somewhere visceral and real. What informs this? Owen: Environment tends to be the first thing I consider when I’m writing a song. There needs to be a place before anything can happen there. I just try to describe that place enough so the listener can imagine him or herself there. I think having that sense of location helps make the characters & actions more relatable. GA: Your music has a very charming and endearingly unrefined lo-fi quality to it. The listener can hear imperfections, they can hear when your voice cracks from sing to speech, they can hear a soft fuzz sometime, sometime the music sounds far away. Why is it important to you to make your music this way? Owen: I think in the same way that the places that I sing about in the lyrics are important, it’s also important to give some sense of the space where the music came from. All of those incidental noises & non-musical elements are to give the recordings a context & physicality. GA: You’ve called your music perversely different than the moniker for Casiotone For The Painfully Alone. What about Advance Base? What nudged you into the direction of becoming Advance Base? How do you think you have changed as a musician? How do you think you have remained the same? Do you think change and the vitality of music are interrelated? Owen: I don’t remember saying that exactly, but I think I probably meant that over the 13 years that I made music as Casiotone for the Painfully Alone, I perverted the initial intentions of the project. I started CFTPA with the idea that I’d only write torch songs, using only battery-powered keyboards, & only in the key of C. I loosened those restrictions after the first few albums, until I realized that the name just wasn’t relevant anymore. I didn’t start Advance Base with any kind of aesthetic designs. I think the new album sounds like a logical next step from the final CFTPA album, but I don’t know what that means for the next one. Everything I write winds up sounding like me, but my tastes & abilities have changed over the years, & I expect they’ll continue to change. GA: In your interview of Mark Kozelek, he calls you a lyrical genius. It’s not quite the same as hearing this from Mark Kozelek, but I think you are too. How do you choose your words? Why are words important to music? Owen: That is incredibly generous of you. I work really hard at my lyrics. I don’t think anyone is every going to put on my records because they think I’m a great singer. I try to make the words as interesting as I can muster to compensate for my lack of natural ability as a vocalist. GA: What’s a lyric from Advance Base that reflects you as a lyricist? From Casiotone? Why? Owen: I don’t think I have a good answer for this. GA: The closing song on the A Shut-In’s Prayer, “Shut-In River Blues”, is poignant. And completely wordless. What inspired the placement of this instrumental track? What do you think the music is “saying” here? Owen: “Shut-In River Blues” was the first piece of music that I recorded post-Casiotone. It owes a lot to the John Fahey tune “Sligo River Blues” in the sense that I basically stole the whole thing. I tried a few times to write words for it before deciding that I preferred it as an instrumental. I put it at the end of the record because I liked the way it echoed the piano melody of the first song on the album, only in a different key. I thought it gave the album a nice, cyclical feel. Advance Base A Shut-In’s Prayer was released on May 15, 2012 by Caldo Verde Records and Orindal Records.